You may have noticed on the Puppy Cam that the whelping box is gone. Coral, Opal, Aqua, Topaz, Taz, Amber and Diamond have moved on to a much larger space. Crystal enclosed part of the room, so the puppies have lots of space but aren't able to get into mischief. The puppies have lots of new surfaces and objects to walk on and explore, including a wooden board, an aluminum pie tin and a big red ball. Not only do these new objects stimulate their minds, but they also get the puppies used to encountering new things in their environment. These puppies may become service dogs, and they'll need to take changes in the environment in stride. For example, a balance dog must be able to walk calmly over drainage grates. If the dog were to swerve to avoid the grate, he may injure his partner, who is using him for balance. The pups are also learning crate behavior. It's important for the dogs to be calm and quiet in their crate. 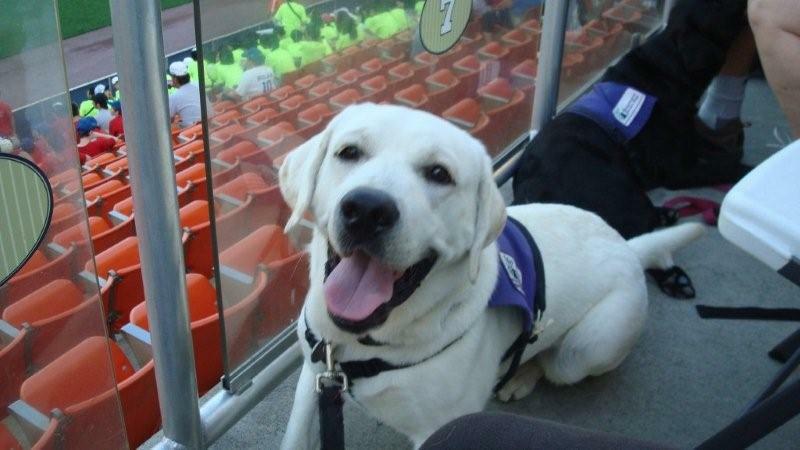 There will be times when a service dog needs to be crated, and they need to stay calm and not get stressed. 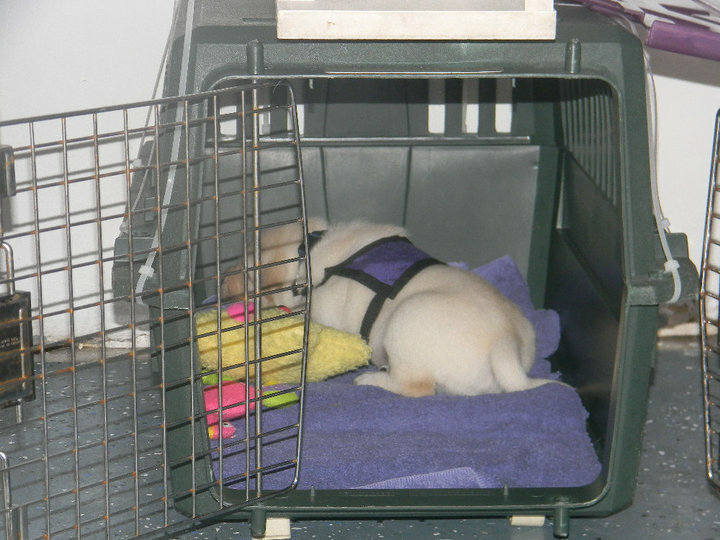 When we first start crate training the puppies, we fill the crates with soft blankets and toys. We also put open crates in their whelping box or area. The puppies are free to come and go in the crate as they please, and sometimes they even go in to curl up for a nap. When the puppies are three weeks old, we start closing them in the crate with at least one littermate. After three to five minutes, we open the door and let them out again. Overall, we want to make sure the puppies learn to associate the crate with good things, so it becomes a place where they can relax. Some of the Gemstones puppies like the crate more than others. Most of the puppies want to jump right out and start playing again. But not Taz! In the short time he was in the crate with the door closed, he curled up and went to sleep. Crystal just left him there with the door open. He woke up in a little bit and wandered out of the crate. However, he just looked around, and then went into the neighboring crate to sleep again! July may have been extremely hot, but Nubble has a way to cool off. His puppy raisers got him a kiddie pool, and he has been having a blast playing in it! He runs around, runs through the pool, and lays down in the water. He has been having even more fun since Donna and her family fenced in part of their yard for the dogs. Nubble can now run free without Donna worrying about him running away. They've been working on his recall outside, especially now that they have the fence, and he has been doing great! He has also been improving on stairs. Donna has several steps leading from the back door, and at first, Nubble wouldn't go up them. However, after a little work, those stairs are no problem! The Northeast Division had another puppy outing. This time, they went to a Wilkes-Barre Yankees game, the local minor league baseball team. 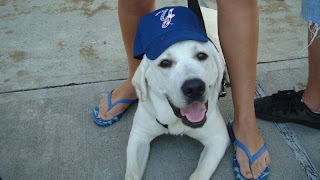 Even though Nubble is a Phillies fan, he seemed happy to wear the Yankees' hat for the evening. 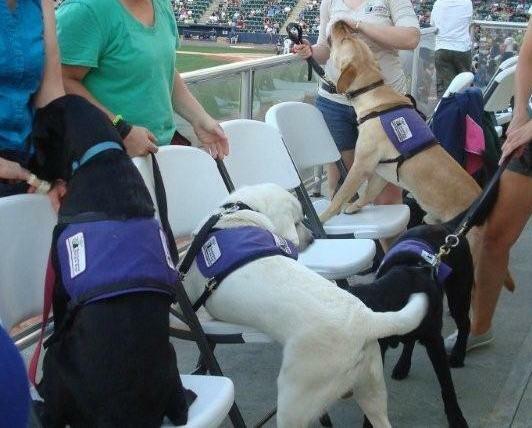 As the ball game, the dogs-in-training practied up on the chairs. The cue up asks the dogs to put their front feet on an object. Even though the chairs were slippery and the dogs couldn't get a very good grip, they still did a great job with up! They also practiced on a glass fence. Nubble and the other dogs met the Yankees' mascot, Champ, and Nubble had no fear of him. 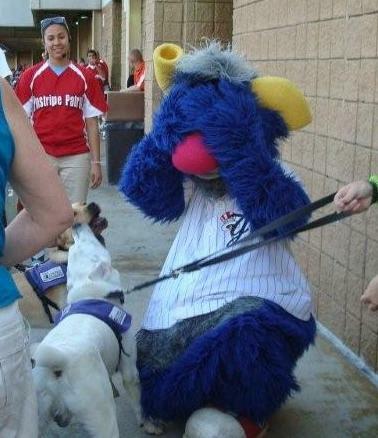 Sometimes, when a dog encounters a mascot or someone in costume, he will be very hesitant or even fearful. The handler then needs to work with the dog, using the clicker and lots of treats, to help him learn that costumes aren't something to be afraid of. But Nubble had no fear of the mascot. 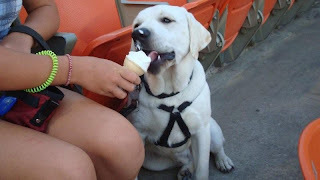 Later, Nubble enjoyed his first ice cream cone. Boy, did he love it! It was a very successful outing for him. He seemed to take everything in stride. Even when it started to rain and people swarmed the exits, he was still able to focus and sit. This past weekend, he got to play with a five-month-old German shepherd. They had a wonderful time running in the yard from the kiddie pool to the dirt pile to a leaf pile and back to the pool. They then chased each other round and round the pool. There were two other dogs visiting as well, and Nubble quickly learned which dogs wanted to be his playmate and which ones would rather be left alone. It was good experience in dog manners for him. Nubble did get into a bit of mischief this weekend. He picked peppers out of Donna's friend's garden! He would run by and just grab a pepper and bring it to her friend! Needless to say, after all this running, he was exhausted by the end of the weekend. He slept from 7:30 p.m. on Sunday to 9 a.m. Monday! Donna has been working on go to bed with Nubble. He seems to need constant refreshing. He does great by the end of the training session. Donna is using shaping to teach the behavior. The next day, however, she finds that she needs to back up a few steps to remind him what she wants him to do. That's the nice thing about shaping - it's so easy to back to up where the dog can be successful and move forward from there. 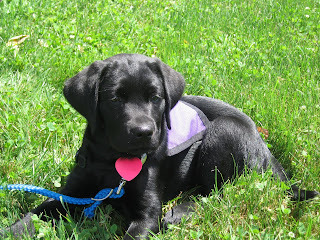 Next week, Nubble is going on his first camping trip with his puppy raisers! It should be quite an adventure for everyone. They're staying by a lake, so Nubble will be able to do one of his favorite things - swim! We'll share the tale of his camping adventures next time. 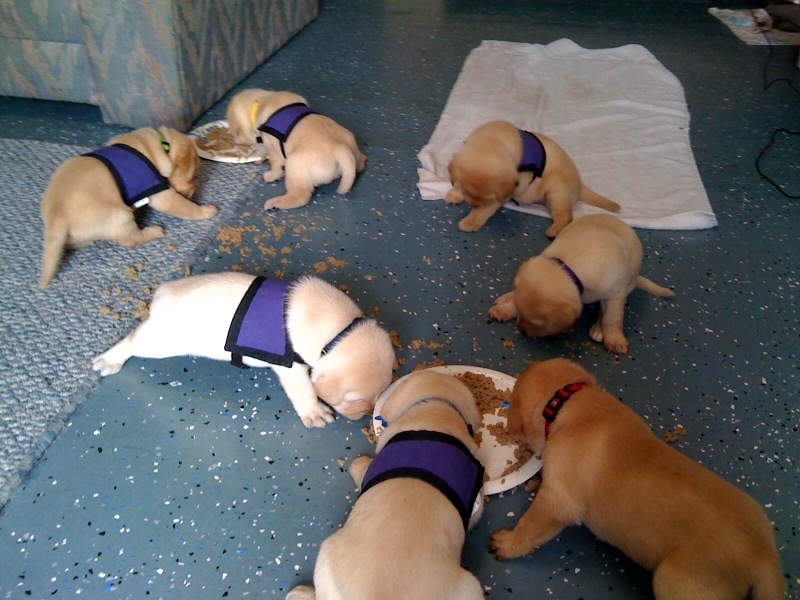 Puppies + food = one big happy mess! 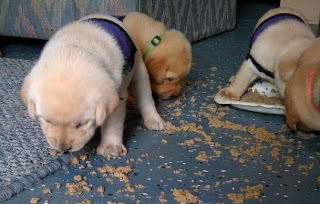 If the size of the mess they made is any indication, the Gemstones puppies really enjoyed their first real meal! 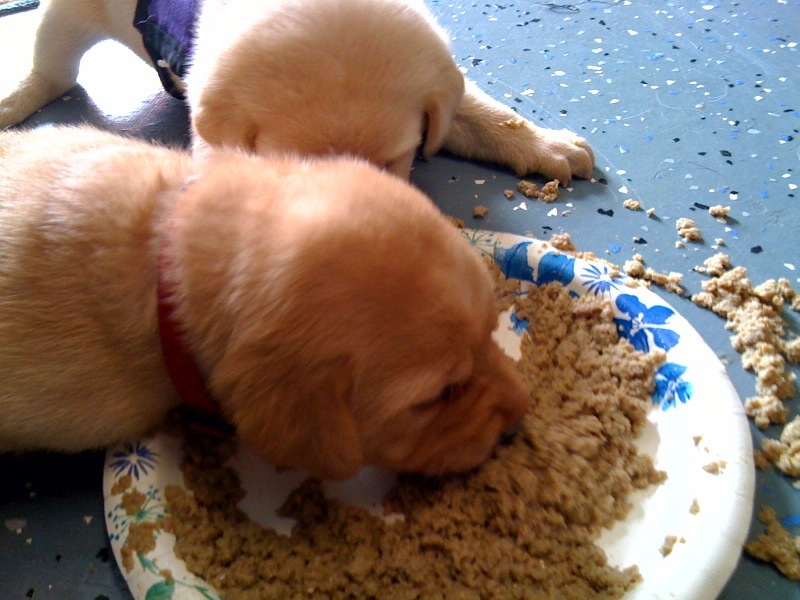 When the puppies are about three weeks old, we start them on softened puppy food. Diamond was the first to dive in. As soon as Crystal, the puppies' breeder caretaker, set Diamond in front of the puppy food, she dug right into it. She was doing such a great job eating the new food that we joked that we better get the other puppies around the plate before she ate it all! The other puppies soon smelled the food and came over to investigate. Without any prompting, they started chowing down, too. Soon there was just as much puppy food on the floor as there was on the plates! Watch a video of Coral, Opal, Aqua, Topaz, Taz, Amber and Diamond eating their first real meal. Even though they had just eaten all that puppy food, they still wanted to nurse. 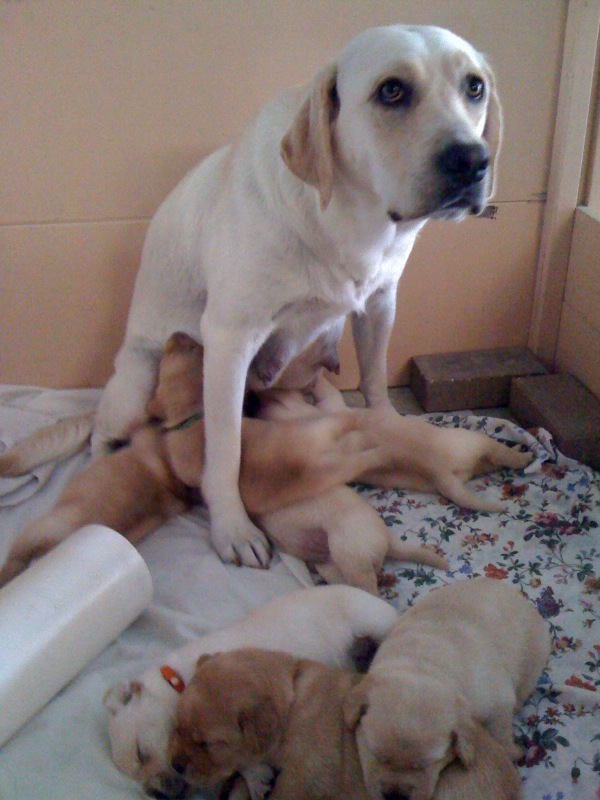 After Pearl helped clean up some of the puppy food, the puppies started nursing. 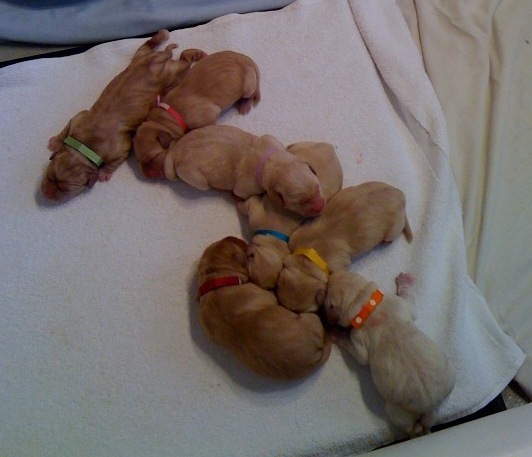 Soon, Pearl was stretched out and all seven pups were lined up in a row. As the puppies finally got full, they wandered off and settled down for a nap. Aqua smooshed her face between her mother and the coffee table and promptly fell asleep. Diamond wiggled under the computer chair to nap. 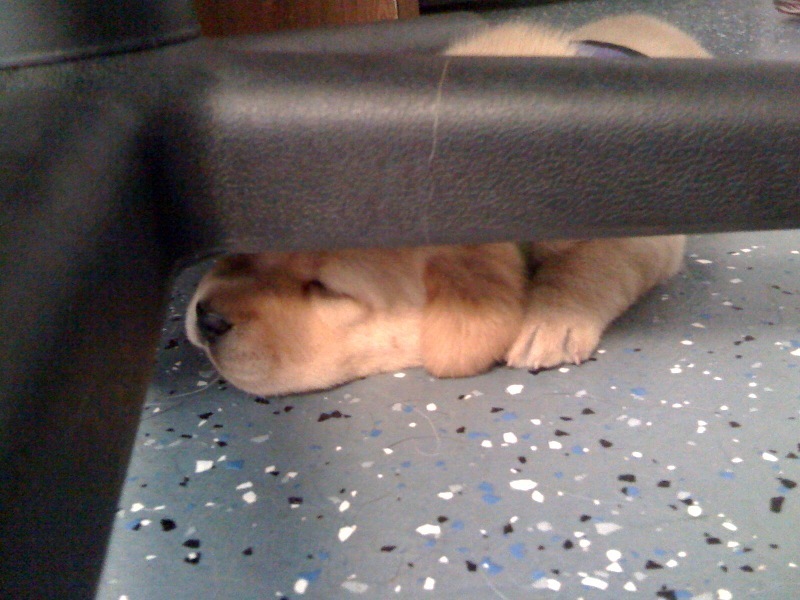 The other puppies found comfortable places on the floor. All that eating is hard work! The Gemstones puppies are two and a half weeks old, and already their collars had to be changed twice because they've grown so much! Their eyes and ears are now open. Crystal, their breeder caretaker, sleeps downstairs with them, and before their ears opened, she had plenty of time to get ready for the day after her alarm went off. After all, the pups slept right through her alarm since they couldn't hear it. Now that their ears are open, though, they're squeaking for attention as soon as the alarm goes off. The puppies have already started solving problems. They figured out how to almost escape the whelping box. If they had been a little bit bigger, they would have succeeded! They discovered that if they used their brothers and sisters as stepping stools, as well as the PVC pipe that lined the inside wall, they could get their front legs all the way outside the box. 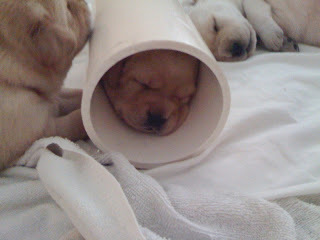 Needless to say, Crystal removed the PVC pipe so the pups didn't escape and get lost! Pearl is taking such good care of her puppies. She certainly has her own way of doing things, though. Most mothers lay down to nurse. But not Pearl. Instead, she sits and the puppies pile on top of each other to nurse. The puppies also have their own spin on nursing. 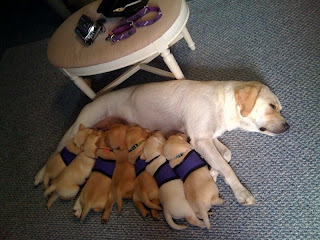 Puppies typically lay on their stomachs to nurse. If it becomes necessary to bottle feed puppies, you would hold them on their stomachs to feed them, which ensures that the formula goes down the right pipe. The Gemstones, however, have been known to nurse on their backs! We're sure that as these puppies continue to grow, we'll have lots more stories! Gemstones on the Puppy Cam! Coral, Opal, Aqua, Topaz, Taz, Amber and Diamond are live on the Puppy Cam! You can now watch these adorable puppies online. These puppies aren't just any adorable puppies, though. They're going to be trained as service dogs. They'll learn to open doors, turn lights on and off, retrieve dropped items, become invisible in restaurants and much more. Give the Gemstones a birthday gift to help them start their lives as service dogs-in-training. Your gift could change a life. We hope you enjoy the Puppy Cam! We love watching the puppies! Dylan, Zappa, Hendrix, Grace and Jagger are now rocking out at the kennel! They arrived last night and settled right in to their new home for the week. Today, puppy hugging started up again. However, puppy hugging at the kennel is a little bit different. 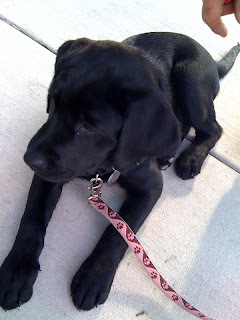 We have a list of tasks for each puppy hugger to do with the puppies, including walking in the woods, crate behavior, loose leash walking, basic clicker work, play retrieve, riding in the car, and putting their harness on and taking it off. Here Zappa practices loose leash walking. He just woke up from a nap and wasn't too sure he wanted to walk at all, so one of his puppy huggers tried practicing recalls to get him to move forward. Walking and playing in the woods is great for stimulating the puppies' mental growth. Grace and Dylan play together in the first video, and Hendrix and Jagger play in the second. These puppies love playing with sticks! While in the woods, our puppy huggers practiced recalls. Here Dylan is wandering along in search of some interesting smells or sticks, but when his puppy hugger call him with "Dylan! Puppy, puppy, puppy! he comes running right to her! In the training room at the kennel, Grace and her puppy hugger practiced play retrieves with a tennis ball. Although she doesn't actually bring the tennis ball back to her puppy hugger, she does bound back soon after she is called. Jagger got to meet some of the campers during our second week of Summer Camp. He had a great time going from camper to camper and getting lots of attention! The campers loved it, too! These puppies will be at the kennel all week. 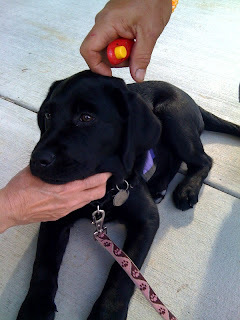 On Friday, they'll have their puppy temperament test, and then we'll match them with puppy raisers! All the puppy raisers who are getting a puppy from this litter will be notified on Friday. On Saturday, puppy raisers will get their new puppies, and their first major event will be our SSD picnic that day! We're looking forward to it! It's time to graduate from SSD Summer Camp! Each of our campers and their dogs walked up to receive their certificate for completing the camp. Except we wouldn't just hand it to them. No, each camper and dog had to perform a trick first. Congratulations to all our campers! Our SSD Summer Camp is designed to teach kids about service dogs and dog training, as well as general dog care and etiquette. And, of course, have fun with the dogs! After practicing clicking and treating, we moved on to shaping, which is a training method in which behaviors are broken down into tiny steps. The dog must master each step before the trainer can move on to the next one. We had the campers shape each other to do things, which is always entertaining for everyone! Finally, campers were paired with their dogs. Rather than having the kids choose their own dog, we try to match each camper with the dog that we feel would be a good match for them. We want each team to work well together and have a fun week. Once each camper was paired with a dog, they practiced free shaping and loose leash walking. On Tuesday, we set up stations and each camper-dog team practiced a different skill at each station, such as attention to handler, sit/stay, down/stay, leave it, get dressed and go on through. Afterward, each camper practiced grooming, including brushing, ear cleaning and tooth brushing. To make it fun, we had a competition to see who could get the biggest hairball from brushing and the dirtiest cotton ball from cleaning ears. It's extremely important to clean up after your dog, and we turned it into a game. Using brightly colored Playdough, we created "dog poop" and scattered it outside. Then the campers had to scoop the poop. The camper who scooped the most Playdough poop won a prize. Since it rained on Wednesday, we went to the Harrisburg Mall, where campers and the dogs practiced their skills in public. Thursday brought the sun, so we worked outside at the kennel again. We focused on proofing, which means asking the dogs in different ways to perform behaviors in different environments. Proofing helps ensure the dogs will be able to perform behaviors regardless of the situation and environment. One of the most entertaining games we play with the dogs is "How to Make a Peanut Butter and Jelly Sandwich." We divide the campers into two teams and have them write out the steps to make a peanut butter and jelly sandwich, using the principles of shaping. Then one of our volunteers would literally follow the steps. So if the instructions said "take out two pieces of bread," we would take two pieces of bread outside. The PB&J game shows just how important it is to break steps down into tiny, clear steps. Today was the culmination of everything the campers learned. At the Colonial Park Mall, they took a modified version of the public skills test that our partners take when they get their new service dog. They did very well! Congratulations to all of our campers! We hope you enjoyed your week as much as we did! Do you remember the first time you ever went to the movies? The smell of popcorn and the thrill of seeing the action on the big screen? SSD Nubble went to the movies for the first time! While he didn't have that same sense of wonder that you probably did (he's a dog, after all), he still had a blast being in a new place. When Nubble arrived at the movie theater with his puppy raisers, Donna and Lindsey, there were a lot of distractions competing for his attention. He was very interested in the lights and noises. Almost immediately, a group of children swarmed him, asking lots of questions. Nubble did extremely well until two small children started running around. Then he decided it was play time. However, Donna and Lindsey were able to get him focused again. Once they were in the theater, Nubble faced another challenge. He had to climb up the steps to get to their seats. Nubble usually has trouble with stairs, but this time, he walked very nicely up them. It may have helped that the steps were very wide - more like landings - so all of his feet could be on one step at a time. Donna and Lindsey chose aisle seats so Nubble had plenty of room. Even though the movie was two and a half hours long, he did great! He spent most of the time trying to get Donna's attention. First he would sit. Then he would give a down. Then he would visit (put his head in Donna's lap), and visit, and visit, and visit. Visit seems to be his new favorite cue. All in all, Nubble did a very nice job on his first trip to the movies. It was a week of firsts for Nubble. He and Donna also participated in their first SSD demonstration. Nubble was joined by SSD Caspian, Graham and Slate, and they did a demo for 65 children with autism. Since it was their first time, Donna focused on making sure Nubble was on his best behavior. She asked him to sit and down while the other dogs did more involved demos. 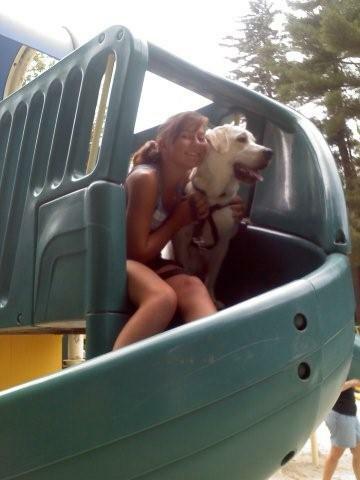 But Nubble didn't just sit the whole time. He showed the children how nicely he heels. He also got to practice doing stairs because the demonstration was on the lower level of a church, and stairs were the only way to get down there. On Saturday, the Northeast Division went to Community Day, where they listened to a great band and the dogs got to meet tons of kids. Nubble is finally starting to realize that kids are not playmates and that just because the kids want to play with him does not mean that he gets to play with them. Great progress! 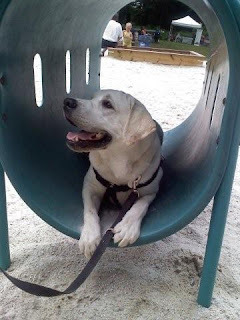 He also played on the playground, which is a great experience for the dogs-in-training, especially with all of the new surfaces and objects. He dashed down a small slide without a problem, but he didn't seem interested in the spiral slide. Lindsey sat at the top with Nubble and Donna shaped him to go down the slide. The shaping session ended when Lindsey started sliding and couldn't stop, and Nubble had no choice but to follow. (Slides are called "slides" for a reason!) However, Nubble did make some progress. Donna has been working on back and leave it with Nubble. The cue back means that he should back up wherever he is. He will back up nicely as long as he is standing in front of Donna. However, they're still working on getting him to back when he's beside her. So far, he's making nice progress, although sometimes he backs up while he's sitting! But he seems to understand the concept. Leave it is a bit more challenging for him. He tends to leave objects alone, but food is another thing entirely. He will leave it, but then he'll dash right back and scarf it up. Donna plans to keep working at it. Nubble has made some great progress in shaping. Donna shaped him to bring her Gizzy's dog dish. (Gizzy is the family dog.) Nubble can also remove a hat from someone's head! At the demo, Caspian's puppy raiser had shaped Caspian to remove a hat from someone's head, and Donna decided to try to train Nubble to do the same thing. At home, she used shaping to teach him this behavior. At the beginning of the session, Donna expected that Nubble would simply maul the hat rather than bring it to her, but he surprised her! Using very tiny steps, Donna successfully shaped him to bring her the hat! They started by clicking and treating just for looking at the hat, then gradually increased the criteria until he was bringing the hat right to her! Look for more progress from Nubble in the coming weeks. We have another litter of puppies! SSD Pearl delivered the Gemstones - five girls and two boys - on the Fourth of July in one of the calmest whelpings our whelping team has ever seen. She amazed everyone by resting or sleeping through most of it! After each puppy was born, though, Pearl woke up to care for it. 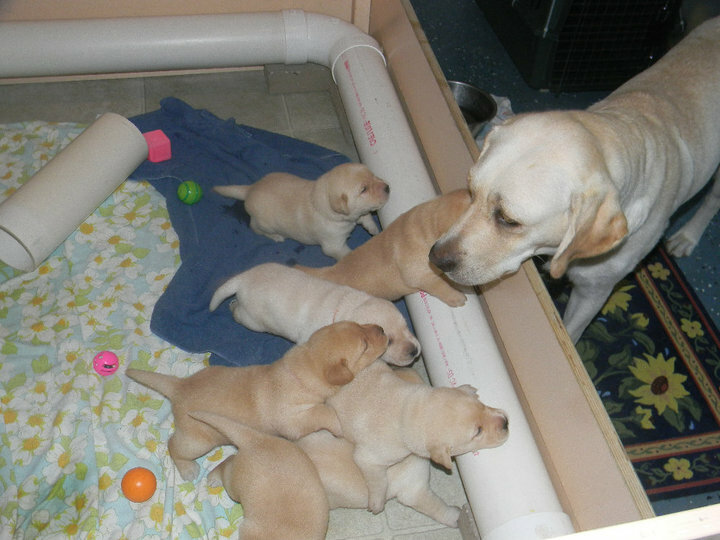 The story of Pearl and the Gemstones puppies began the week of Mother's Day. Pearl was bred to our own SSD Fire, a handsome dark yellow lab. It must have been a good luck charm to have the breeding around Mother's Day because when Pearl went for her ultrasound on June 7, we learned she was pregnant! The vet thought there would be six to seven puppies. Pearl has a reputation of being a very calm, extremely relaxed dog, and she kept her reputation intact throughout her delivery. In fact, she didn't seem to show any early signs of labor, even when she was actually in labor! On the evening of July 3, Crystal (Pearl's puppy raiser and breeder caretaker) took Pearl's temperature and saw that it had dropped, which is one of the signs that Pearl would go into labor in the next 12-24 hours. However, she showed no other signs of going into labor. Often, the female will start panting and pacing, only sleeping for short periods. Pearl slept almost the entire night! The only difference was that her snoring came out in short snorts rather than long, drawn-out snores. Crystal's daughter, Alisha, slept on the couch with Pearl, and Crystal woke up several times during the night to check on Pearl. After going out for her normal walk, Pearl settled right back on the couch, only to surprise everyone about an hour later with the arrival of SSD Coral, a yellow female, at 8:34 a.m. on July 4! Crystal called Cindi, our training and breeding coordinator, and she walked her through caring for the newborn. The whelping team arrived soon afterward, in plenty of time for the delivery of a second yellow girl, SSD Opal, at 10:57 a.m. The next three puppies followed in quick succession - SSD Aquamarine (Aqua), a yellow female, at 11:45 a.m., SSD Topaz, a yellow male, at 11:57 a.m., and SSD Tanzanite (Taz), a yellow male, at 12:27 p.m. All that time, Pearl lay quietly in the whelping box, seemingly asleep. She was so calm in between puppies that the whelping team joked that they knew another puppy was coming when Pearl fell asleep! Pearl rested while the puppies nursed. One hour after Taz entered the world, a dark yellow female joined her brothers and sisters. SSD Amber was born at 1:28 p.m. After Amber's birth, Pearl got a spoonful of NutriStat to keep her energy up. She also received a dose of calcium to help with contractions. Calcium helps build strong bones, but even more than that, it helps the muscles contract. Pearl perked up after getting the NutriStat, raising her head to give the whelping team a big doggie grin. The whelping team took her outside for a short break, following her closely with a towel, just in case a puppy decided to make an appearance. Then she settled right back into the whelping box. One hour after Amber, the last puppy was born, another yellow girl named Diamond. Pearl gave birth to seven puppies in all. 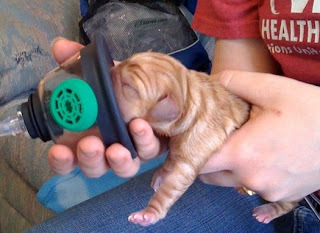 Each delivery went smoothly, although one puppy needed some oxygen to make sure that it got off to a good start. We had our new oxygen masks on hand (we used to use a duct-taped paper cup), and after a few minutes, the puppy was ready to nurse alongside its brothers and sisters. Thank you to SSD Midge's puppy raisers for donating the oxygen! We waited another two hours to see if there were any more puppies waiting to enter the world. Pearl enjoyed some cheese while we waited and the seven Gemstones nursed. Around 4:30 p.m., we suspected Pearl was finished giving birth. The action wasn't quite over yet, though. In its first few hours, one of the puppies had cut the pad on its hind foot. Not wanting to risk anything, we called the vet and then bundled the pup into the portable warming box for a trip to the vet. Four sutures later, the puppy is doing just fine! Crystal is soaking the puppy's foot in Epsom salt water twice a day to prevent infection and help it heal. This is Pearl's first litter, and even though both Pearl and Fire belong to our program, one of the Gemstones puppies will be going to Pacific Assistance Dog Society in Canada. Pearl originally came from PADS. To expand our breeding lines, we have an agreement with PADS to exchange several female dogs of breeding quality. As part of the agreement, one puppy from each litter from these exchanged dogs goes back to the original organization. Every time Pearl has a litter, one of the puppies will go to PADS. 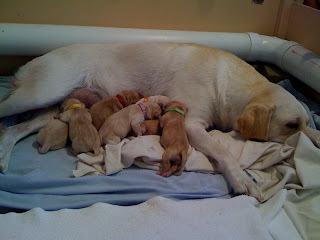 Pearl and all seven puppies are doing great! The Gemstones are located in Carlisle, PA, and puppy huggers are invited to visit the puppies on a limited basis after the pups are two weeks old. 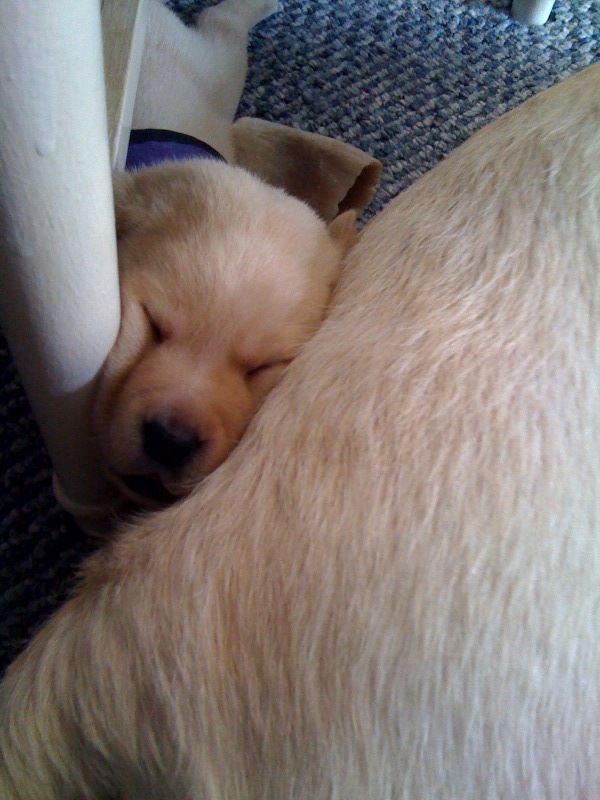 Once the puppies are four to five weeks old, more puppy huggers will be able to visit. (To let mom and puppies get off to a good start, puppy huggers will not be permitted prior to two weeks of age and will be limited until four to five weeks.) 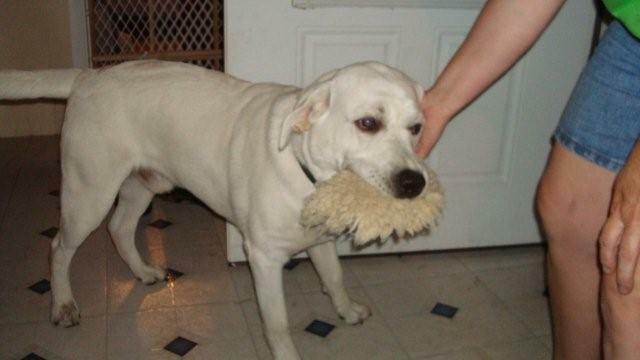 We will send more details when Pearl and the puppies are ready for visitors. Please note that regardless of the puppies' age, if you have a dog that is or has been recently ill, or have been around any ill dogs, please help us keep the puppies healthy by postponing your visit. We're planning on having the puppy cam again. Watch for details in the next two weeks! Congratulations to Pearl and Fire, and happy birthday to Coral, Opal, Aqua, Topaz, Taz, Amber and Diamond! 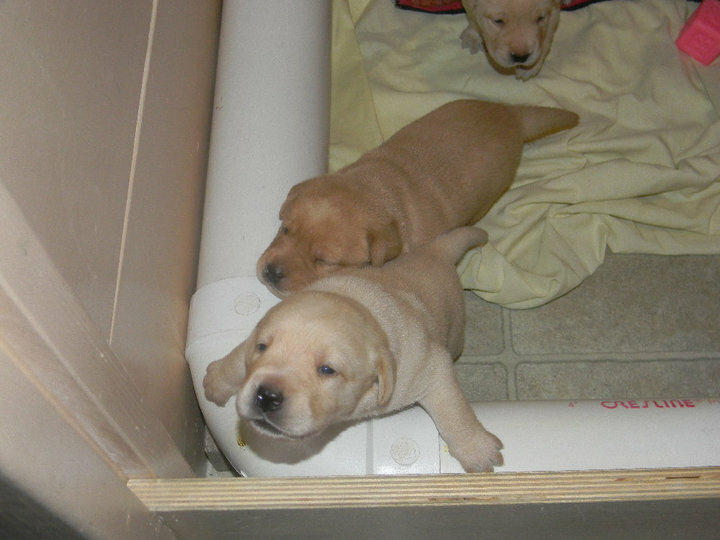 If you're interested in raising one of these puppies, call us at 717-599-5920 or visit our website to learn more! Give the puppies a birthday gift! When we talk about Peach Pie, we're not talking about a delicious dessert made of fruit. We're talking about SSD Peach Pie, a black lab puppy who is just as sweet as her name. Peach Pie flew all the way from Pacific Assistance Dog Society in Vancouver. Even though it was a long flight, she was never in a crate. Instead, she was hand-carried the whole way. U.S. Airways has a group of wonderful volunteers who transport assistance dogs. Peach Pie stayed in the cabin, which is great experience for her because when she she becomes a service dog, she may fly with her partner. Here is a wonderful article about U.S. Airways' Puppies in Flight program: "Dogs Get Flight Training in Charlotte." 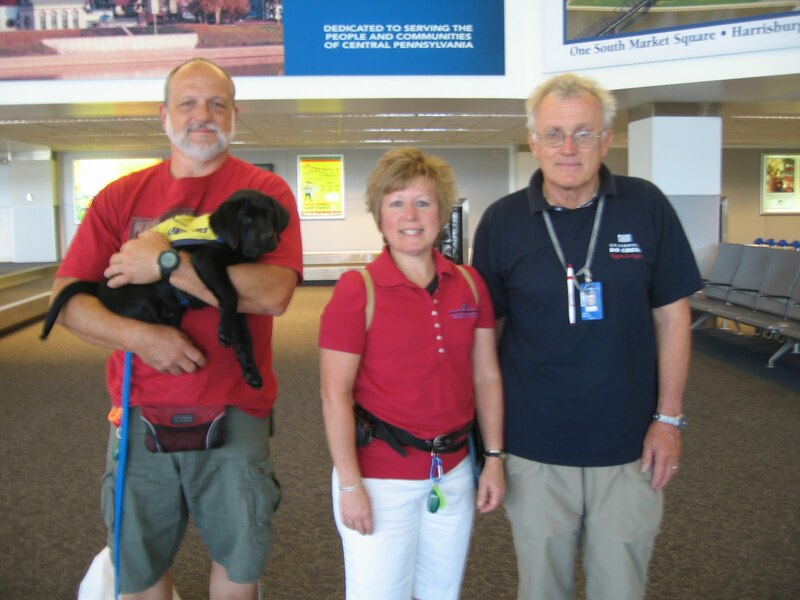 At Harrisburg International Airport, SSD Peach Pie was hand-delivered into the arms of her new puppy raisers. She settled right into her new home. 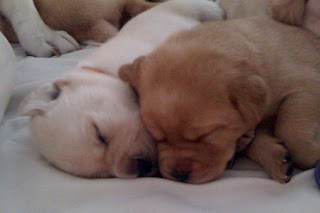 Peach is being raised by SSD Misty Morning's puppy raisers, and she and Misty got along right away. They love playing with each other! When she isn't playing with Misty, Peach is a calm little lady. When she went to the vet, she was as calm as could be. She came to our Social Media Day meetup at La Piazza, and even though there were lots of people and other dogs around, she stayed right by her puppy raiser's side. Even when people came over to pet her, she stayed focused on her puppy raiser, sitting nicely to get her treats while people petted her. Great job, Peach Pie! New Friends and Delicious Food Equals a Great Day! We had such a great time meeting you at our Social Media Day meetup! We love talking to everyone online, but it's nice to meet face to face. At the beginning of the night, there were some unfamiliar faces, but by the end, we had some new friends. Thank you to everyone who came out! We hope to see you again! It was such a beautiful evening, that we met and had dinner outside. Big thank you to La Piazza - they put out bowls of water for the dogs, and even had bowls of dog treats on each table! Over 15 service dogs and service dogs-in-training were there, including new puppies Peach Pie, Phoenix and Falcon! Peach is a little lady - she laid nicely at her puppy raiser's feet during dinner. We had such a good time that we might hold another meetup sometime. New and old friends, great food, dogs - what other reasons do we need to get together?